Over the years I’ve built a number of sub-8ft egg shapes (Nomad Model), mostly 2+1 set-ups, but a few quads as well. The surf conditions in my part of California vary, greatly. This past winter was as good as it gets, while the winter before it (2013-14) was just an extension of summertime, without SW swells. More often than not, surf runs 2′-4′, which is good enough for the ol’ log, but who wants to ride a log everyday? Finding a board that’s a little more “sporty” in performance but can still handle the small stuff is a real challenge. 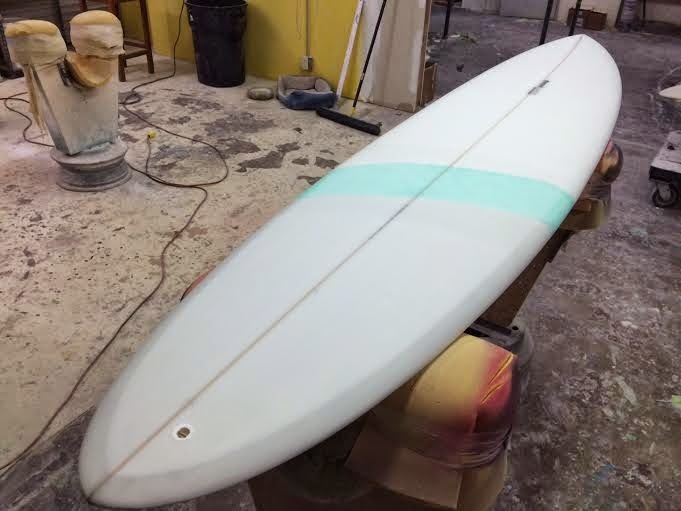 This board is my latest attempt. Dimensions are 8’0″ 16-1/4″ x 22″ x 14-5/8″ 2-3/4″ 55.8L. EPS/Epoxy construction with two-tone resin-tint color, and sanded gloss-coat finish. The board is both light and buoyant. The board has a versatile five fin-box set-up, allowing either quad- or tri-fins. Low entry-rocker makes this board an easy paddler, with good down-the-line speed. Initial trials at Mondos (mush-burger capital of the world) showed that it can handle the small stuff. Just waiting for the next South swell to see how it handles some juice.